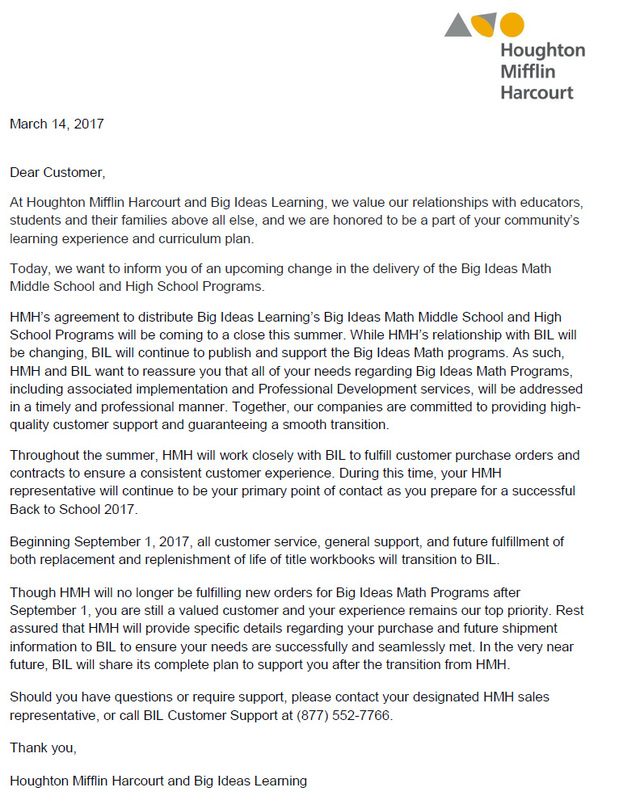 Please see the letter from Big Ideas Learning and Houghton Mifflin Harcourt below. While the relationship between Big Ideas Learning and Houghton Mifflin Harcourt is coming to a close, Big Ideas Learning will continue to publish and support the Big Ideas Math programs, and is fully committed to fulfilling the needs of its customers. Big Ideas Learning has secured a long-term agreement with a new distribution partner, and will share additional details about this partnership in June of 2017. Big Ideas Learning appreciates your continued trust and support during this transition. Please email, bil_support@bigideaslearning.com, or call, 877-552-7766, if you have any questions or concerns. Posted in Uncategorized	| Be the first to comment! Timestamps for late assignments appear in red, while on-time submissions appear in black. Prerequisite skills now show correctly on the Teacher Remediation Report. Timer now accurately shows amount of time spent on assignments. Students can no longer check their answer more than the set limit within a session. Teacher assignment previews now display the correct numbers. The Big Ideas Math platform issues have been resolved. Thank you for your patience and we again apologize for any inconveniences. We are receiving reports that there are issues with accessing the Big Ideas Math online platform. We are currently investigating this issue and will provide updates as soon as they are available. We apologize for any inconveniences. The Big Ideas Math online platform will be unavailable on Saturday, March 4th from 7:00 AM – 1:00 PM ET. Thank you for your patience as we update our system.